Some people say that friends are the family you choose for yourself. I am lucky enough, that although my family can drive me crazy, I still love them dearly (most of the time) and I am also blessed with some amazing friends as well. You may have noticed already from my posts that I have a lot of women in my family and close group of friends…and it’s true! I have a lot of inspiring aunts and awesome cousins and friends. Tonight, I spent the evening hanging out with 2 of the most important women in my life, my sister and my “sister”…aka my sistahs! Let me tell you, these two women share the same birthday, similar personalities, and well…they share me! I love them both very much and it warms my heart knowing that I have these two behind me every step of the way. Which brings me to today’s act of kindness. If you didn’t know, Chicago is a freezer box right now. With single digit temperatures and below zero wind chills, it’s a wonder that the city still functions! As I was driving to work this morning, I encountered an elderly man waiting for the bus, and my heart broke thinking of how cold he must be. 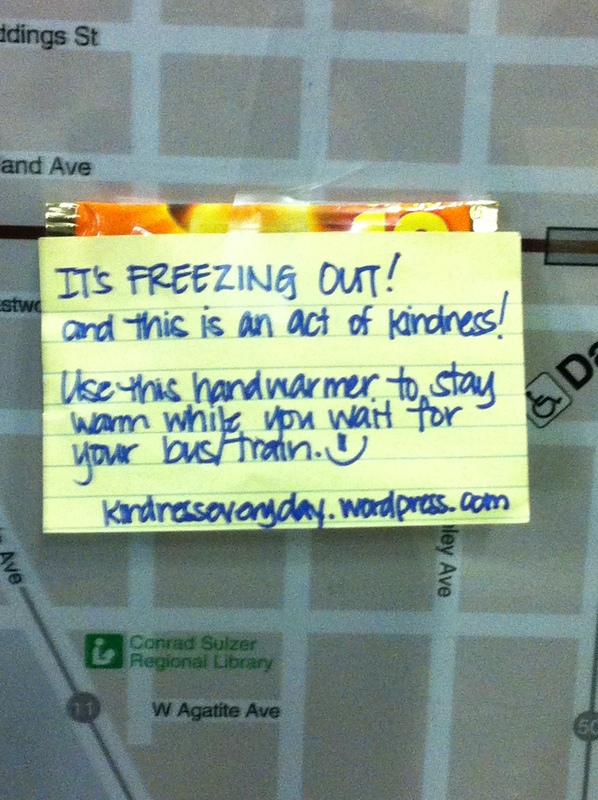 And so, a great idea for today’s act of kindness was decided! 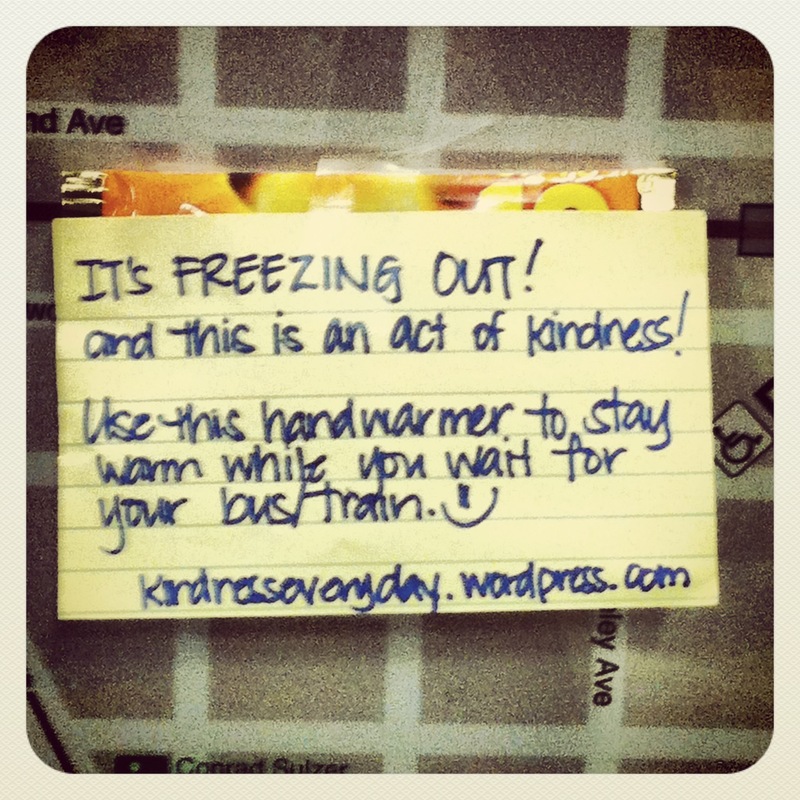 Since I was planning on heading into the city to meet up for the evening, I decided to purchase a couple of those Hand Warmers packets and drop them off at a bus stop or train station for those that commute via CTA in the city. 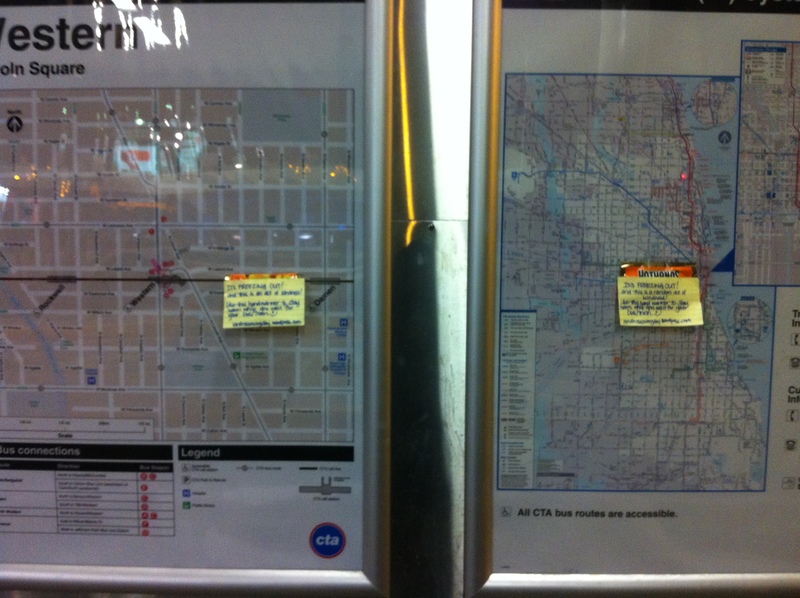 If you were at the Western Brown Line Station this evening, did you notice these post-it notes from the corner of your eye? If you were cold, maybe you should’ve stopped to read them! Hope those who grabbed one was able to stay warm! And I hope you stay warm tonight!